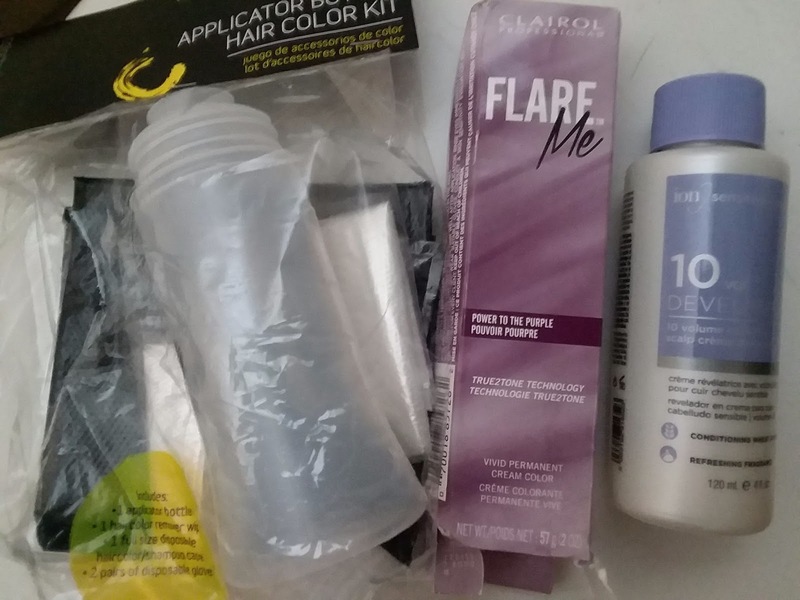 ThemeParkMama: Clairol's FLARE Me Permanent Hair Color Pink Purple Green Blue Etc! 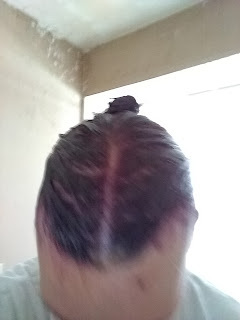 Clairol's FLARE Me Permanent Hair Color Pink Purple Green Blue Etc! Wow! Okay so I finally did it! 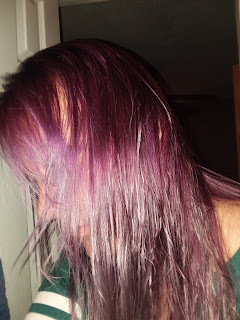 I went purple! I have always since the day I was little loved the idea of black hair, or something not the normal. I finally had my chance to check out the all new Clairol Professional Flare Me Collection. I went with Power to the Purple! Yup, I did it! I went from a bleach blonde to a dark purple and I couldn't be happier. I normally buy the box dye at the store as probably most people do, so getting the color was totally not normal for me and I was completely out of my comfort zone, but because I always ALWAYS have my hair up I figured screw it let's do this. Because it is such a new product there is like no info anywhere, I found another youtube vlog which the girl did pink and it came out great, but that was really the only one and she didn't show how she mixed it or applied just the fact that it came out great. Well before I did this back when I did the Treeumph post I had dyed my hair blonde which turned out to be this bleach set up from L'Oreal Paris Feria Absolute Platinums Hair Color, Extreme Platinum this worked omg it was soooo horrible lol you can see the video how blonde I am bad! So after letting it grow out I am now to today where I am trying out the Power to the Purple! I did my research and figured out that I needed this thing called a developer which what the heck is that? So more research and found out that it is the stuff which makes the hair color stick to head, there are 3 sets 10, 20, and 30. 10 is better on your head and makes the color last long, 20 is what is more common for your box set and gives you 2-3 shades different from what the box tells you and 30 really messes with you giving you like 4-5 shades from what the box would say. I went to Sally's and the only brand they had of 10 developer was the ion brand. I also purchased a hair dye kit. My kit was pretty cool it had a apron thing which I was like look I am superman, because it was worn like a cape, gloves, and hair dye bottle. So I read the box of the Clairol Professional FLARE Me and it said to mix 1:1 color with developer, the color was 2oz so I mixed it with 2oz of the developer. I shook the daylights out of and began to apply it to my hair. OMG this stuff is strong!!!!!! I have a extremely small bathroom and keep leaving it and standing in front of the fan so I could breath it was so strong. I was a little worried because the color was not showing in the bottle and for a little while it looked red. I started with my roots because they were a brownish color and worked my way out. I have fine thin hair so I was lucky to use only one application of color and developer. The box said to leave in for 30 minutes so I waited, and waited and washed it out in the tub. I then used my color protecting conditioner and left that in for 5 mins and showered. I have dyed my hair to many times to count and I noticed right away that this one the color washed off my skin where it shouldn't be with ease and then I notice that after like 5 mins in the shower my hair ran clear, I have always had color come off even after washing the main mess off, I dried it and nothing came off in my towel another first for me. After it dried it really was a nice dark purple. My hair though has rough ends to it so I wanna get it cut but its raining so I have to wait. I will update that pic when I get it. I love this product and now I know what I am doing the possibilities are endless for me :) Here is some fun facts about the all new Clairol Professional FLARE Me line!